Welcome! We would be delighted if you not only visited our homepage but also our guesthouse with homemade food. In the warm months of the year you can relax in our beer garden below the lime trees and when it gets colder outside you can enjoy the beautiful view out of our winter garden. Since the refurbishment we also have a WC for the handicapped. 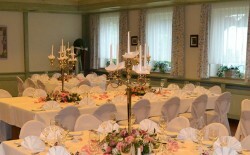 As Lindermayr guesthouse is the inn of Haberskirch we can assess its age at around 370 years old. From old documents we have discovered that there must once have been a private brewery, unfortunately the chronicle of these times does not say much. What we do know is that in 1894 Johann Lindermayr and Kreszenz Kneißl bought the inn. Their son Johann Lindermayr took over with his wife Walburga in 1945. Their son Georg followed in 1968 with his wife Marianne and they have run the place until today.